We provide a wide range of high quality Refractory Castables that is widely used in the power plants, sugar plants and various other sectors. Our High Alumina Refractory Castables are perfect for the back-up and hot face linings. Our High Alumina Refractory Castables are comprised of high quality raw materials that ensure their excellent performance. Low thermal conductivity as well as low density of our High Alumina Refractory Castables assures conservation of heat energy. Moreover, to keep the properties intact for a longer period of time, our High Alumina Refractory Castables are available in quality packing. 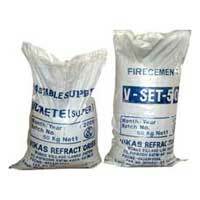 We are counted among the prominent High Alumina Refractory Castables Suppliers based in India. The above data represents average test values subject to reasonable various. Coarser & Flner Grain Size can also be supplied on request.